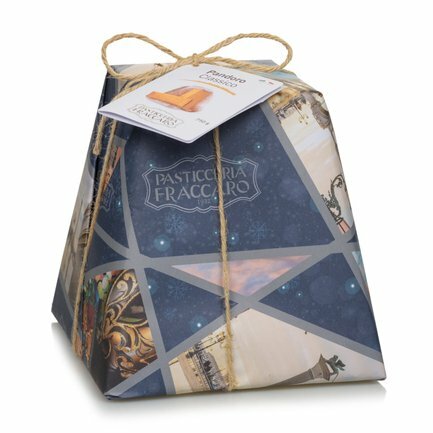 The soft and fragrant Pandoro from Pasticceria Fraccaro is ideal for a traditional Christmas. Very soft dough and special butter make this Veronese dessert sweet, but in a delicate way. Fraccaro's Pandoro will bring joy to your holiday table. Ingredients Flour wheat soft type '0', butter, sugar, eggs cat. A, 5% natural yeast, egg yolk eggs cat. A, emulsifiers: mono and diglycerides of fatty acids, honey, cocoa butter, salt, proteins of milk, natural flavors of citrus and vanilla from berries. Sugar sachet (impalpable sugar, wheat starch). May contain soy. For more information on product labels, please contact our Customer Service department. The information on the labels of the products may vary for reasons beyond our control, therefore, there may be discrepancies between the information on the site and that on the products delivered. Please always check the information on the product before consumption or use. Fraccaro Spumadoro was established in 1932, when Elena and Giovanni Fraccaro opened a bakery inside the walls of Castelfranco, beginning a cake-making tradition that was to become famous over time.